Oh, happy nostalgia, sparking at random! 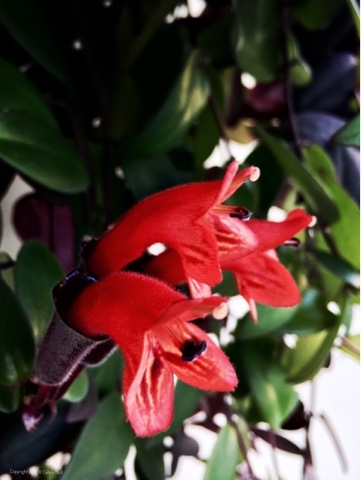 My green-thumbed mum nurtured a lipstick plant as splendid as this one now blooming in the Missoula Public Library's front entry. Early (ie brown pigtails, cherubic grin with dimples) memory snapshots include standing in clear, cool winter sunlight that streamed through the living room picture window, peering keenly at scarlet blooms emerging from the "lipstick" casing, standing as close as I dared and still able to truthfully declare, "I'm not touching!". Of course, I probably was supposed to be dusting, so the Mayberry-esque memory disintegrates right about there...aaand, cut! then fade into the scene with the little red tricycle and pig-tailed child gamely peddling round and round on the one flat pad of concrete on the whole farm. Call me Pollyanna, but I hold that it's not a bad thing to remember the best of times - provided you still subscribe to living and learning. 'tis a gift to cherish the good times, and allow the not-so-good memories to fuel our passion to change the world by bringing joy, peace and love. Along with a good dose of laughter. It's amazing how much living that one flat pad of concrete saw! Oh, yes - it is, indeed, worthwhile to re-focus not-so-good toward bigger picture change!